This post was written by peterjmurray on July 30th, 2014 8:55 am Comments Off on PLENTY OF SUMMER WINE! 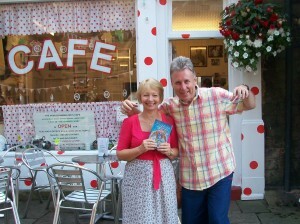 It was with great pleasure Kath and I headed off to ‘Last of the Summer Wine’ country to meet a friend in Syd’s café in the quaint church square. Our friend, Yvette, lives and works in Dubai and has a house in Holmefirth, so it was a good excuse to go and meet her there. The reason for our meeting is that the next Mokee Joe book is set in Dubai and we fully intend to launch it there next year in the Autumn. We’ve visited lots of schools in the Emirates for some years now and have many Mokee Joe fans out there and we felt we owed it to them. The meeting with Yvette couldn’t have gone better. Yvette works for the Emirates Literary Festival and is more than well-placed to help us with our launch. In fact, Kath and I intend to fly out to Dubai in January next year to meet up with Yvette again to plan the launch in more detail. Anyhow…hope all our fans are enjoying their hols…I really must get on with my writing. I’m currently on Chapter 3 of the new book and poor old Hudson and his friends are about to start living the nightmare again. Whatever did they do to deserve their horrific encounters with Mokee Joe! 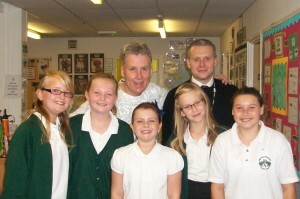 Pete and Simon with Amber, Elisha, Ellie, Maya and Kathryn...fans at Wooton Primary. To round off our academic year, Kath and I (and Simon) are at our favourite place…the Isle of Wight. We absolutely love it here! Three ‘Isle of Wight pearls’ to work in – Wooton Primary, Arreton St George and Broadlea Primary…followed by a complete week’s rest on this fab isle. Ann Moran welcomed us back to Wooton Primary; I think it’s our third visit here…maybe even four! The presentation went down a treat as we presented our latest Mokee Joe book and talked about our collection of stories from across the pond, PS 13. Afterwards, we signed loads of books and five great gals interviewed us for the school magazine…see pic. Can’t wait to read what they wrote about me…it had better be good or I’ll send Mokee Joe around to sort them out! Arreton St George Primary followed and this school has a special connection for me. As a child we stayed on the island at the nearby Stickworth Hall, a spooky old hotel, but now converted to flats. We had fab holidays there. The school is also near to our current island hideaway, but I’m not saying where or it would cease to be a hideaway! The Mokee Joe presentation went down well, despite the school projector being awkward during the second half of the proceedings. The Year 2’s were invited along and they sat riveted to the show and seemed to thoroughly enjoy themselves…well done to them! Thank you to Mrs McInnes for looking after us so well. The book-signing the next day exceeded all expectations for such a small school and we ran out of books! A real credit to the school’s interest in books and literacy! We’ll definitely be back! Broadlea Primary tomorrow for our last presentation for a while, and what a way to finish…a spectacular Bonebreaker presentation! Watch out Broadlea…things are about to get scary! 10th ANNIVERSARY ROTHERHAM WEEK SUCCESS! This post was written by peterjmurray on July 1st, 2014 10:02 am Comments Off on 10th ANNIVERSARY ROTHERHAM WEEK SUCCESS! Our good friend, Debbie Billard, of St Anne’s Juniors and Infant School in Rotherham, took it upon herself to suggest and arrange a fabulous week of events to celebrate ten years of me working as a children’s author. We are so grateful to her for all her hard work on our behalf…hope you like the flowers, Debbie! 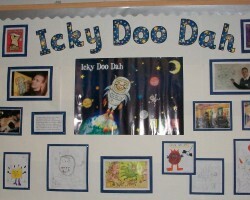 It was also interesting to see so much evidence of our son, Simon’s, work – Icky Doo Dah – everywhere around the school. A hard act to follow! We started the week off by meeting up with teachers and librarians on Monday afternoon, during which I took our guests on a whirlwind tour of my life in Rotherham, my upbringing and the series of unlikely events leading up to me becoming a children’s author. I can’t believe so many turned up after a hard day’s work…and especially on a Monday! However, the audience seemed well-entertained and St Anne’s put on some tasty refreshments for us all to enjoy before and afterwards. Jamie Noble turned up to represent Rotherham United Football Club and we are very grateful for his involvement in helping us promote literacy in the Rotherham community. Through him, we have launched a short-story competition open to every pupil of the schools involved in the Anniversary Week. Thanks, Jamie…and especially for the great prizes you have put up to entice the thousand or so pupils taking part! Over the rest of the week we performed Mokee Joe presentations in front of large audiences of KS2 pupils from St Anne’s, East Dene, Coleridge Road, Herringthorpe Juniors and Badsley Moor Lane Juniors. All went extremely well and lots of books were signed, e-mails subsequently received from grateful and inspired pupils and many pleasant memories recalled from me being brought up in the area during my childhood. The highlight of the week had to be the Wednesday visit to my old school, Redscope Primary School. The experience was beyond our wildest expectation… brilliant from start to finish! 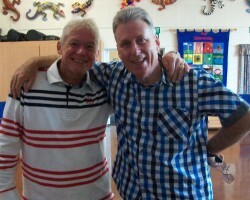 As soon as we walked into the school I was greeted by a familiar face from the past – Mick Johnson, the school caretaker. Mick was at Redscope the same time as me as a pupil in the year below me. His face and expression were exactly the same…full of mischief! It was great to see him looking so well…a real ‘blast from the past’. A special cake was baked by one of the staff in the form of my first book – Mokee Joe is Coming! It was presented by the Head prior to me starting my presentation. Kath and I were almost in tears. A great day followed, part of which involved opening the new outdoor reading area specially created for the school (congratulations to Jim!). The Rotherham Advertiser turned up and, all in all, it was a great event. A special mention and thanks to Ms Walpole for looking after us so well…but ALL of the Redscope staff without exception were a joy to work with. Brilliant! The entire week was a huge success and Kath and I are really touched by all the good wishes and welcomes we received from the staff and pupils of our home town over the week. Thank you again to you all! We will keep coming back, you can be assured of that!